You will typically be a logistics user, provider or another consultancy company needing specialised expertise for an assignment or training. You are likely to come back for more - we are very proud of our repeat business record: over 95% of our business is repeat (or the first assignments that generated those repeats) - that's from start of business in 2001 and including all of 2016. That figure rises to 98% of our non-training business - the figure is lower for training, but not for bad reasons - see the bottom of this page for more details. And you probably already know us or have been recommended to use us: 97% of our non-training business has come through networking of one sort or another - but don't worry if you don't know us, we love meeting new people! 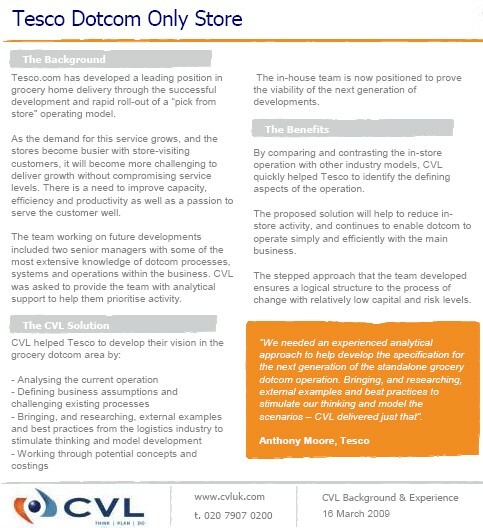 Much of our current work is confidential, and so we're unable to talk about it - but here's a link to a case study on the work that Kirsten did for CVL for Tesco Dotcom. And, here's an example of some analysis in the public domain, which we carried out for British Waterways some time back. NB 12MB+ file. Our training business: Including training our overall repeat business rate is 95%. Training assignments do have a lower repeat rate as many are one-off - the intention, particularly with mapping training, is to establish some users within your organisation who can then become your own knowledge bank: "I'm now regarded as the company's expert" is feedback that we've had on more than one occasion. And a higher proportion of our training assignments come to us through non-networking sources, for example, responses via our website.